Its prompted protests and the hashtag #SchumerSellout. The Senate approved a spending bill to keep the government open through Feb. 8 Monday, but some liberal activists aren't happy about it — and they're blaming Democrats. That's actually putting it lightly. Some started the hashtag #SchumerSellout, referring to Senate Minority Leader Chuck Schumer. That's because the bill to reopen the government didn't include official protections for undocumented immigrants. 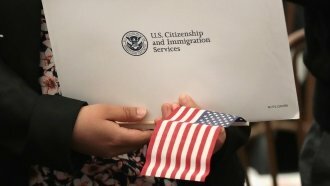 Related Story What Are Undocumented Immigrants' Few Paths To Green Cards? Democrats initially said they wouldn't support a bill without legislation on the Deferred Action for Childhood Arrivals program, or DACA. Senate Majority Leader Mitch McConnell promised a vote on DACA by Feb. 8 in exchange for Democratic votes, but that wouldn't be legally binding. The House also passed the bill, so now it's headed to President Donald Trump's desk.